1. “Our vines are cultivated in the Languedoc-Roussilon region with Old World passion and simplicity. Made from carefully selected grapes prized for their character and balance, the flavor reflects France’s famous winemaking expertise, but with a relaxed style.” Red Bicyclette website, home page. 2. “Between 2006 and 2008, Languedoc exported 160 million bottles of Pinot Noir which is odd, considering the entire region produced only 67 million bottles of Pinot Noir. You do the math, but that is a boatload, no, an aircraft carrier-load of fake wine. How could this happen? Greed, my friends, and a mega-producer like Gallo and their flagship Languedoc wine, Red Bicyclette, to support it.” David Flaherty, Grapes and Grains, NYC. 3. “One does wonder, however, at the role of Gallo’s own buying team, who presumably tasted all the lots of Vin de Pays d’Oc, enough to fill 16 million bottles, that were sold as Pinot Noir but were in fact very substantially cut with other varieties much more widely planted in the Languedoc.” Jancis Robinson. 4. The judge said “the scale of the fraud caused severe prejudice to the wines of the Languedoc for which the United States is an important outlet”. 6. 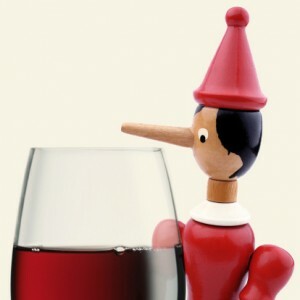 “That doesn’t speak well for the palate of American consumers of inexpensive wine.” Dana Kennedy, Aolnews.com. 9. Red Bicyclette Pinot Noir 2005 won a clutch of medals in the US, and the 2006 ’83 points, Wine Spectator online’. (Red Bicyclette website, ‘Awards and Accolades’). 10. “So what if the French sent us their unwanted wine? We sent them McDonald’s.” Eric Arnold, Forbes.com. 11. “Until we accept that some wines just can’t be made on the cheap, we’re being sold the wine we deserve.” John Bonné, The Cellarist, San Francisco Chronicle (to whom I am grateful for the word, Pinotgate). 12. “Mr and Mrs Johnson will buy a “Pinot Noir” because they saw the movie Sideways, but wouldn’t know whether to drink a Gevrey-Chambertin or pour it over their pancakes. And they know French wines are supposedly superior, but damn confusing, so in comes Gallo to bridge this gap. An American wine producer moves into the French countryside, discards the AOC system, buys massive amounts of juice and sells varietal-labeled wine off France’s doorstep. Brilliant, really. A bottle of French Pinot Noir? For under $10? Perfect! And a cute man on a bike carrying baguettes? Even more perfect. Oo la la!” David Flaherty again, in possibly the best commentary on the scam.